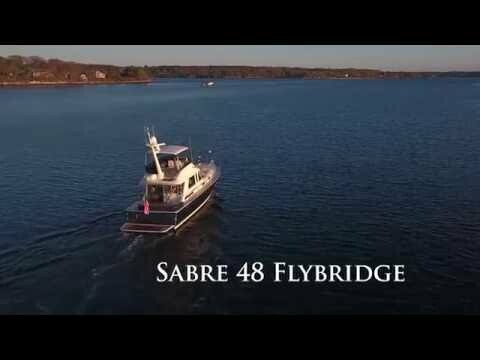 Designed with our experienced and adventurous owners in mind, the Sabre 48 Fly Bridge is the perfect combination of the traditional Downeast style and the wind-in-your-hair freedom of a fly bridge. Nautically sensible design choices preserve the living space inside the pilothouse, meaning our owners do not have to compromise between their indoor and outdoor experience. The Sabre 48 Fly Bridge offers unparalleled views, providing unrestricted sightlines while underway and clear views of your surroundings while docking. An endearing space for al fresco dining and entertainment, with the full power and control of a traditional helm including joystick controls, makes the 48 Fly Bridge a practical and elegant addition to our successful Salon Express series. The expertly designed stairs leading from the cockpit to the bridge provide security during ascent and descent with full steps and handholds everywhere they are needed. Modified Deep “V” Planing hull design, with shallow pod drive tunnels. 14º deadrise at transom, 23º deadrise amidships. ISO NPG white gelcoat w/vinylester back-up resin. Bottom, topsides and transom VIP resin infused biaxial E-glass with Corecell SAN foam core. Stringer system biaxial E-glass with foam core. Resin Infused E-glass swim platform with molded-in anti-skid surface. PVC rub rail with stainless steel cap. Painted (Urethane) double boot top. VIP resin infused biaxial E-glass with balsa core. Sliding windows in salon on cabin sides. Electric opening window in salon aft bulkhead. Hinged access door to side deck at helm. Flush, outward opening, transom door with latch. Anchor locker with slam latch. Large lazarette/engine room access hatch in cockpit sole with compression latches. Cummins DTS single lever electronic controls. Cummins Smart Craft display (engine data, tank levels, vessel data, alarms). Triple windshield wipers with washers. Switch controls for horn, running lights, anchor light, engine room blower and optional equipment. Stazo 400mm custom teak steering wheel with tilt helm and Sabre logo. Solid surface galley counter top. Stainless steel under mount prep sink with cover. Two burner electric cook top. Drawers and storage lockers below counter. Built-in waste basket. Recycle bin below steps. Spacious island berth athwartship layout with laminated trim. Drawers under berth and in bulkhead aft of berth. (2) hanging lockers fore and aft of bed. Sound deadening soft headliner panels. Spacious island berth, with laminated trim. Drawers under berth, A/C return grille beside. Storage lockers, drawers and shelves. Stainless steel under mount sink. Shower stall with seat and locker outboard. Solid surface vanity top with bull nose.